I didn't expect to take as many online classes this year, but I have already signed up for at least two and I'm trying to decide on the Sketchbook Skool class too. Lilla Rogers' MATS Bootcamp starts on Monday... and I have been doing my best to keep up with Journal52. Accountability seems to be the key to my actually keeping up with a class or finishing any project I start. Accountability to you all gets me out of bed most days! I will post my journal pages for Journal52 here on the blog at the end of each month. If I don't - you all should feel free to make a fuss. OK? It's not too late to join if you want to play along. It's an easy-going group with Chelle posting one prompt each week with some cool ideas to try. If you are also doing Journal52, please feel free to put a link to your own art in the comments below. We'd all love to see! I used a lot of Sheer Heaven in these pages. The first week, "Up Up and Away" - was based on a steampunk-tangle piece I did for the book The Beauty of Zentangle. I did a pale transfer of just the girl and her skirt, turned her into a hot air balloon and painted over the whole thing with watercolor, and Inktense pencils. For week two, "Somewhere, A Simple Place," I transferred a photograph I had taken of a fairy house my kids and I built on a beach in Maine. 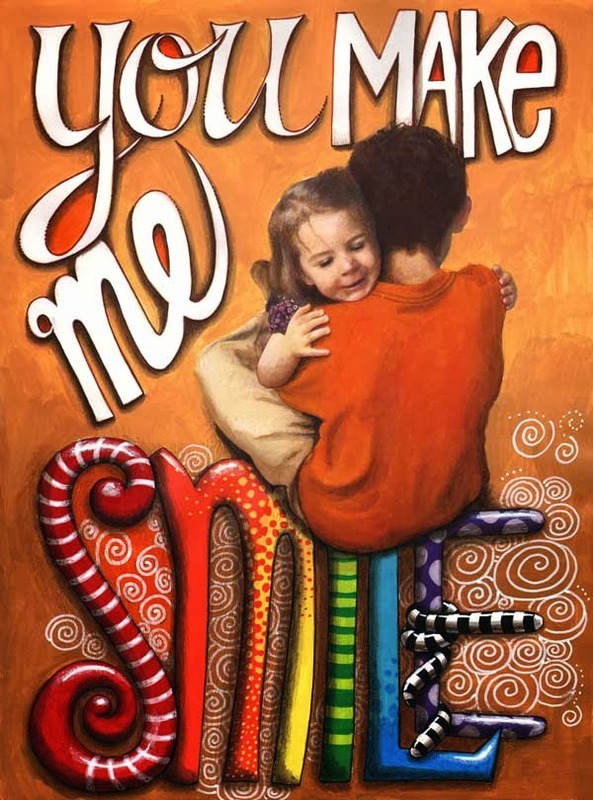 I drew the text (lyrics from a song by Phillip Phillips) with Micron pen, and painted over the pale photo with watercolors and colored pencils. Lilah art directed this piece. She insisted the word "SMILE" be a rainbow. I think she was right. I am usually inspired by something, an image, a quote, that leads to my own artwork. I don't just draw. I have to start somewhere. Quite often something pops into my head - which is why I really love prompts. I drew it with a brown Micron pen, then colored it with watercolor and Inktense pencils. I liked the finished piece a lot! But, I had an image in my mind of an architect's drawing... sort of a sepia-blueprint. Like a design or patent sketch. I know I accuse my daughter of being a little Art Director, but I think I have another one inside my head... yes, I did it over again! I'm not completely crazy... I started with a Sheer Heaven transfer so I wouldn't have to do all the work again. 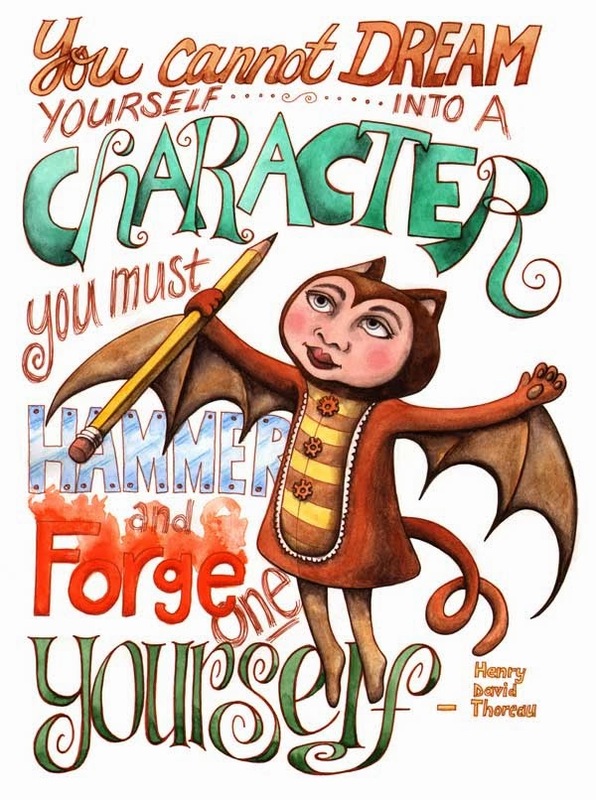 Now that I think back on the process of creating this character, the quote seems really appropriate. I spent two full days (and late nights) working on this journal prompt. It's not real "work" - I don't get paid. It's not even created for someone - as a gift or a dare. It was just an idea. Something that was rattling around in my head and it needed to get out. 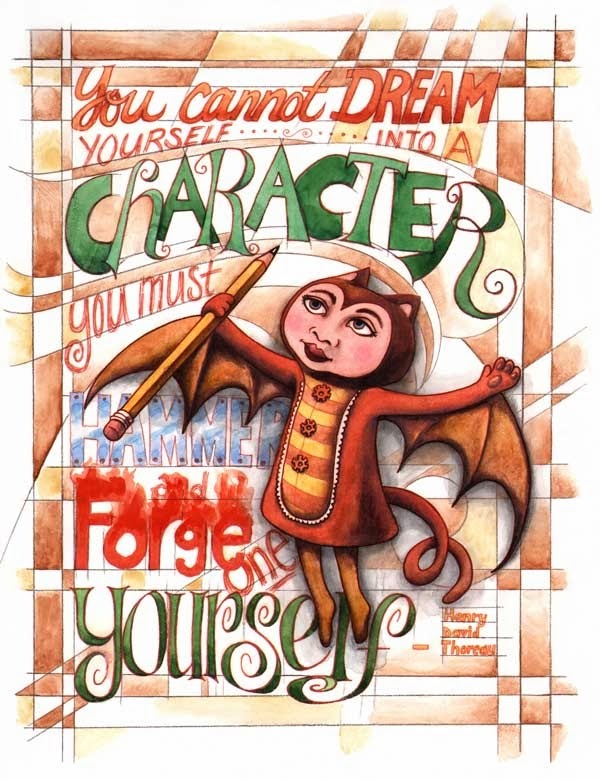 Barbara Pederson sent me the following notes and artwork and I think they are lovely. Be sure to look closely at the details in the tangled hair. I also love the way that the paper texture actually creates a new background "tangle" in the colored piece. I am just a beginner but I did this last night and I just love it. Your book inspires me and the set of cards really help me to think of where patterns will work in my tanglelation. I love making one of your "ladies" and filling in the patterns. I can think of so many ways to do their hair and clothing... it's so much fun. Thanks so much. I so enjoy this craft. It is so freeing. Since I started drawing the "ladies", the ideas just keep coming and coming. I especially like doing their hair. So much fun I can't stop! TANGLE LIBRARY - I have an APP! I have an APP! I have an APP! I have an APP! 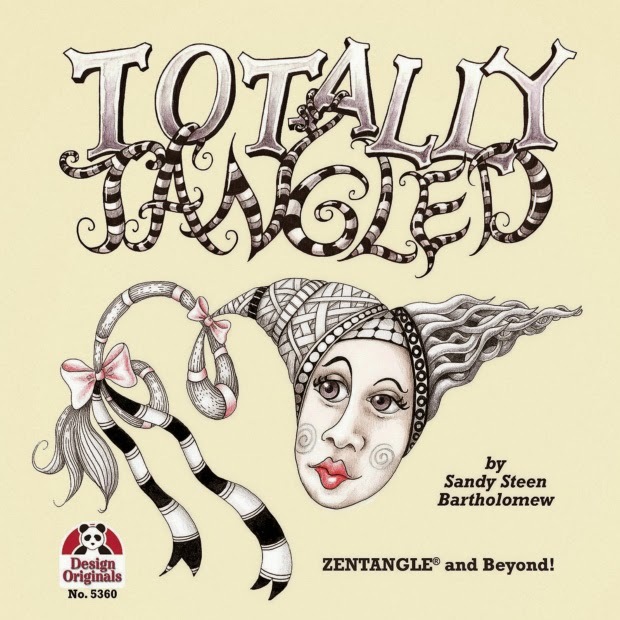 This app will show you how to draw 40 gorgeous tangles by published author and Certified Zentangle Teacher™ Sandy Steen Bartholomew. 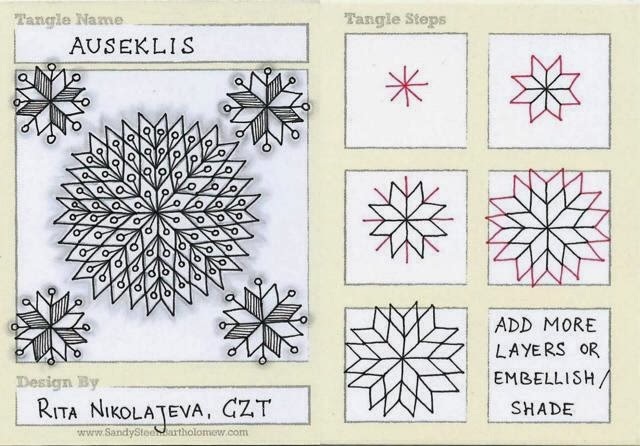 These tangles are structured patterns that are easy to make and fantastic to look at. All you need is a pen, pencil, and paper to start making beautiful art! Once you've created your masterpiece, use the built in photo tool to take a picture of your work and file it with the tangles you used. 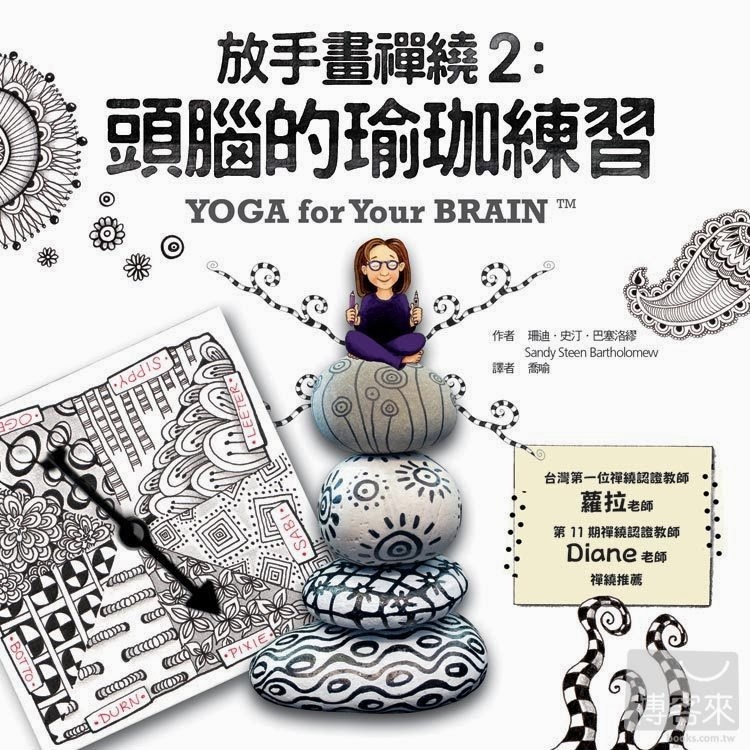 - 40 tangles from Sandy's "Tangle Cards - Yoga For Your Brain" card pack. Each tangle includes a picture of the finished pattern and step by step visual instructions so you can make them yourself. - Filter the tangles by shape, shade, and more to find the perfect tangle for your composition. - Star your favorite tangles to easily find them again. - Use the built in photo organizer to take pictures of your finished drawings. You can later review your photos organized by the tangle used. - Also includes a quick start guide to tangling for those new to the process or who could use a refresher. Tangle library is designed for iPhones and iPads. Want to SEE the face that belongs to the voice on the video? Ian McDowell is the genius behind the Tangle Library App. Visit the Tangle Library web site to learn more. Got questions? Got opinions (for the developer)? There's a FAQ page for that! And LIKE us on Facebook so you'll be kept up to date on additional tangles, or if it becomes available for Android phones (we'd need an Android Developer for that). It will be available for a limited time at a super-special introductory price... then it will go to it's regular price of $4.99 (still a bargain). Please remember that the App is sold through Apple on the iTunes store. If you have a problem purchasing it or downloading it, I can't help you. You will need to contact them. If you have comments on the App itself, Ian would love to hear them. We'd both love to hear praise! And we appreciate any help in getting the news out to the rest of the world. 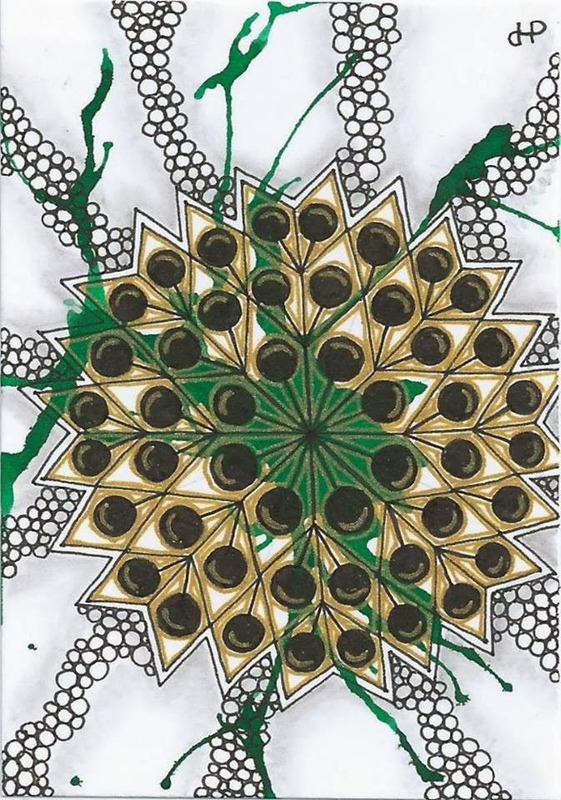 Actually that would be a good title for a world-wide Zentangle Challenge! And now, my publisher sent me copies of my books in Chinese and Japanese! I think it's pretty cool how the Chinese characters are also filled with tangles! I wonder who did the new art? The rest of the book looks pretty much the same. On the back cover they put random quoted reviews from Amazon. There is one from "Quercus Design" which is my own sister! 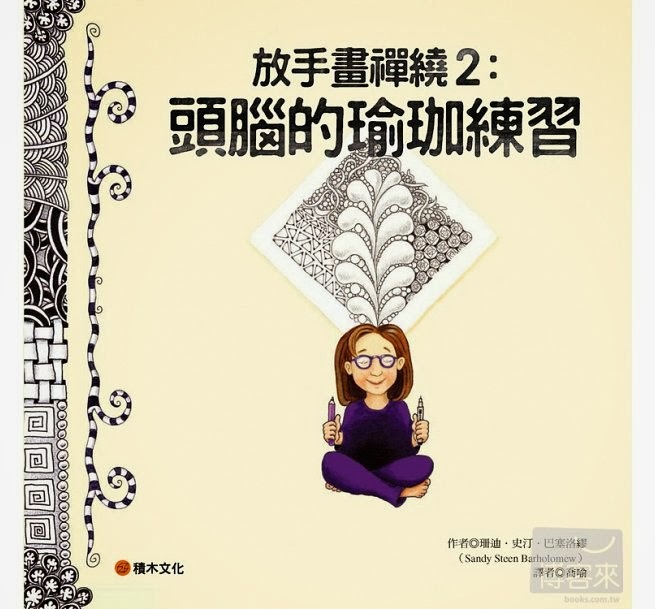 Too funny - but kind of ironic that it's on the Chinese one, not the Japanese book. My sister studied in Japan for a year - she could have read that book. This is the publisher's info, Cube Books - cute the way they did it with the table and chair. ... and some of the inside looks kind of like Joy, but reformatted. But then it starts feeling odd, since there is a lot of my artwork that has been... "re-combined". And the gallery page includes some stuff from Suzanne's fabric tangle book - and my apron. I think this page looks weird in comparison to the rest of the book - which is nicely packed with tangles. These pictures are all cut and pasted from different places but without any explanations or context. If you can get this book, and read Japanese, I imagine this is a really good deal. Three books in one, like a "Best of..." book. Seriously. It's packed! If you'd like to see inside it, click here. I admit it is a thrill to see my books translated!! The Perfect STAR for "The Bauble Tree"
Just before Christmas, I released my ebook, "The Bauble Tree," with step-outs and techniques and ideas... and a challenge to show me what you do with it. Rita Nikolajeva took the challenge even farther by integrating the Bauble tangle with a new tangle of her own design - Auseklis. Love "The Bauble Tree"! Here's my version of the Baubles, arranged as a star, with golden inner aura (done in my new favourite gold pen - Pilot Choose Gold 07). Just in case, my step-out for the eight-pointed star I used in the previous ATC. "Auseklis" is Latvian for "morning star", it's an ancient symbol based on a double cross. It offers protection against evil and forces of darkness, and keeps safe the soul of a sleeper. Stars are usually female in Latvian mythology, but Auseklis is a he-star, and often referred to as the bridegroom of the Sun. Don't you agree, this would be the perfect star for the Bauble Tree?! And this also shows that Bauble can be used in so many different designs other than just a tree shape. I'd love to see what you all come up with! 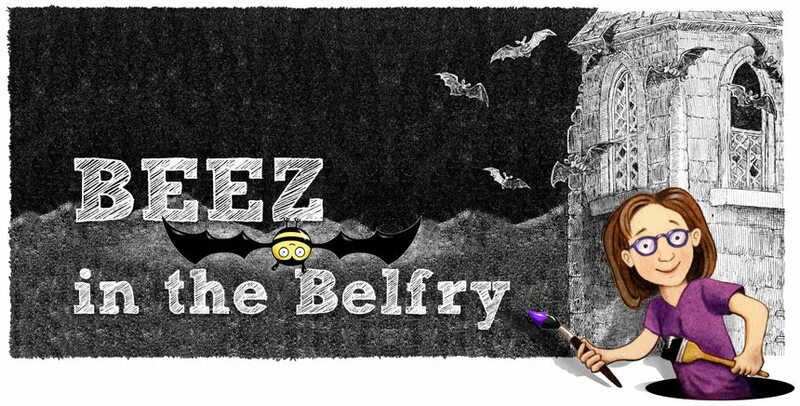 You can get the ebook HERE and feel free to post your creations on BeezInk Studio's Facebook Page, HERE. 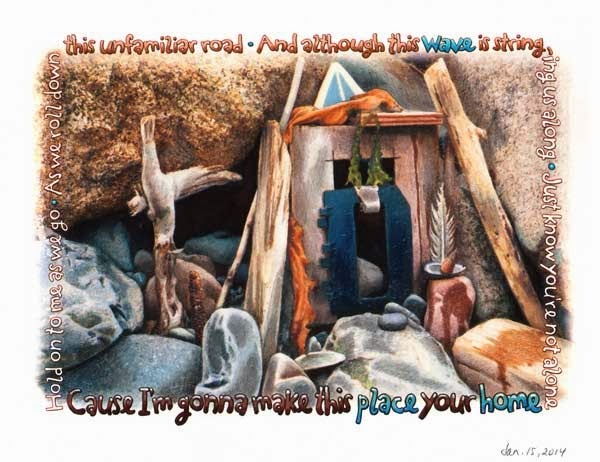 My Word for the Year is "Excavate"
I was driving home on the highway tonight, when I had a Vision. Or maybe it was a reverse vision? I had just spent four hours at a tiny, Western-themed, BBQ saloon in a NH summer lake resort town - that was shut down and boarded up for the winter. (The town was boarded up, not the BBQ saloon). I'm not sure if any of the adjectives in that long sentence really go together... but, well, that's where I had been. One of the ladies asked if I have always felt out of place or did I ever feel like I belonged somewhere. No. Nothing has ever felt permanent or rooted. When I bought this house and renovated it, painted it, mural-ed it and studio-fied it - then I thought it was "mine." But the divorce showed me just how impermanent people and things are. Although I am currently still living here, I know this house is just borrowed. As we all hugged, climbed into our cars and drove off into the freaking cold, dark night... I kept thinking "did I ever feel like I belonged?" I was in a good mood though and didn't want sad thoughts bugging me so I turned up the radio. I found myself singing along to "Red Red Wine" and that's when I had the Vision. It was so strong I knew that if I closed my eyes and then opened them again (too bad I was driving a car at the moment!) - I would see the canals of Venice in front of me. I was seventeen years old. Just graduated from High School. I had my left arm hooked with my friend Christie's elbow. We were sharing a Walkman, dancing over the Rialto Bridge. We sang "Red-red-wine you make me feel so fine..." as we twirled around tourists. I could feel the sun, the blisters on my feet from walking around Italy for weeks, the blush on my cheeks when an Italian guy smiled at us... my absolute joy in just being alive and in that particular moment. Me and Jen and Jen in Venice, Italy. Age 17. And then I was driving along I-89 again. In the dark. 44 years old with two kids and 27 years of later experiences that are not nearly as vivid as that one moment in Venice. It hit me that one of my kids is almost the age I was in that vision. And then, weirdly enough, I suddenly understood WHY vampires are usually around 17 years old. All these Twilight stories and Vampire Diaries I've been reading have characters who are struggling with the idea of being "frozen" as a teenager. In Twilight, besides the whole issue of becoming a soul-less, blood-sucking monster, Bella's big dilemma is if she becomes a vampire as a teenager, she will stay that age forever and never get to experience a normal, human adulthood. But when she becomes a vampire (sorry to spoil it for you) not only does she stay young forever, but every sense becomes heightened. She sees, hears, tastes... experiences life in a way mere humans can't. Huh. Maybe "adulthood" is overrated? 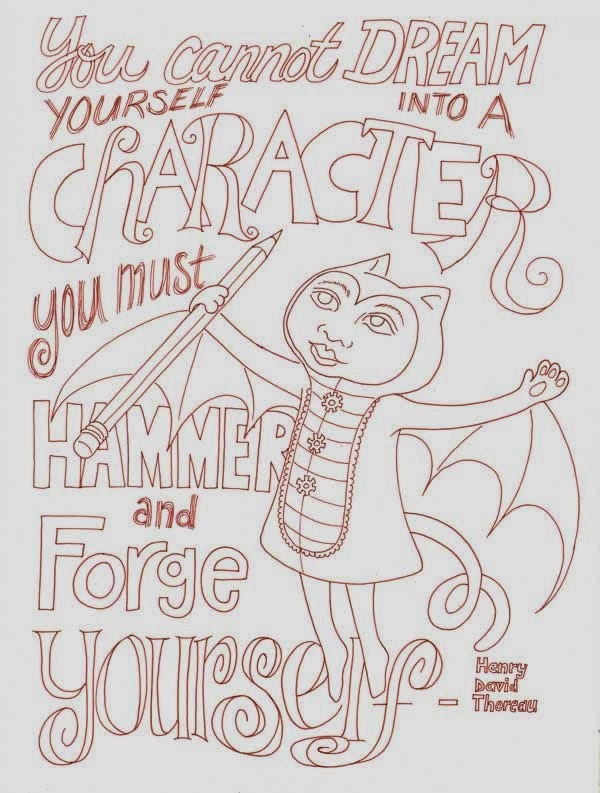 I think I had done most of my forming and "becoming me" by the time I was twenty. Everything after that seems like just check marks on a "to-do list" for adults. Christie and Me in London. Age 17. I want to be the person I was when I was 17. I'm not saying I want to give up all the experiences I've had since then, or my kids, or any of my life. But I want to be that person who felt anything was possible. I never felt like I had all the time in the world, as some teens feel. Doctors had put an expiration date on me. But maybe that added to the sense of "nothing to lose" and "do it now or never." When I got home tonight, I went looking for my scrapbook of my adventures to find a photo to show you. I haven't looked at them in a long time. I was stunned by all the other places I went that year and the next... besides Italy, I went to Japan and Egypt and Mexico... and Brown University and School of Visual Arts and RISD... so much packed into one scrapbook (and there were at least 6 other books on that shelf I haven't looked at!) Time and stories whizzing by! I had another memory of being on a train hurtling through the Italian countryside. Windows wide open because everyone in my car was smoking. It was so hard to breathe - I had my head out the window. A station sign flew by that read "POMPEII"! And with all my soul I wanted to stop the train and explore Pompeii! How could we just pass by a place I had wanted to visit all my life? But it was gone, and I still have never been back there. "Did I ever feel like I belonged...?" Yes. The vision of Venice reminded me that I DID once feel like I belonged. But it wasn't in a house, or a town, or even with a group of friends. I belonged in a moment. In myself. In a feeling. All these years of "trying" to fit in - as a wife, a mom, a board member... whatever... I managed to forget who I was. Last year, my focus for the year was on "learning" - I overdosed on taking classes! This year, my word for the year is "Excavate." Like the archaeologist I intended to be, I will use my training to spend this year excavating the layers, the stratigraphy, of my life and my art. Some things may be better left sealed in a tomb! But it seems worth the risk to me, now, to see what jewels may still be buried there. Besides, "excavate" sounds so much better than "regurgitate," don't you think?